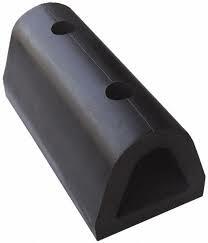 Molded of hard rubber, hollow in the middle, 84" in length. Choose from with 3 different heights. Height measurement is the flat back where it is fastened to the trailer. 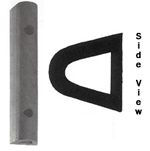 Comes with pre-cut recessed holes for bolt-on installation. If the length of your bumper is shorter than 84", you may still order this bumper, but please measure the bolt-hole locations carefully! These bumpers are hollow, and can be cut with a saw. They can also be drilled with additional bolt holes (do it yourself). For accurate measurements, lay the bumper on a flat surface & measure the flat back for the hole pattern.